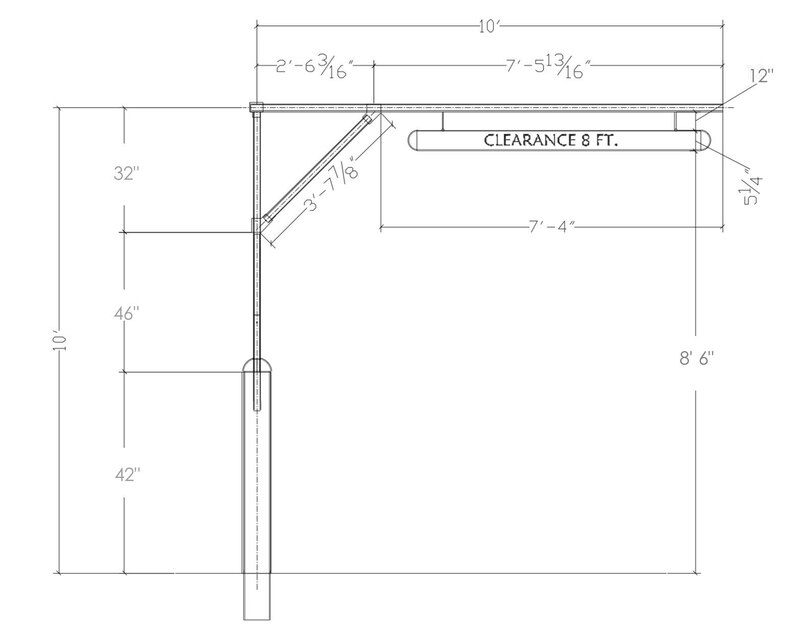 The Free Standing Clearance Bar System is a self-supporting clearance bar. 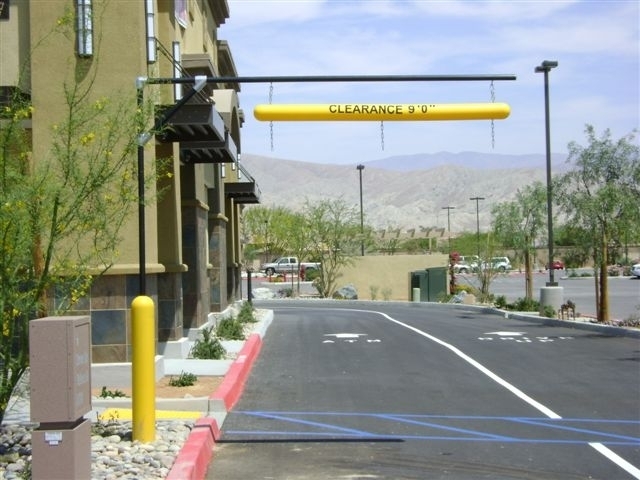 The Free Standing Clearance Bar System is 10' wide and available in 3 overall heights, 10', 12' and 13' to the top of the horizontal support bar. The base bollard is 6" diameter pipe, the vertical and horizontal support bars are 1.25" in diameter, and the actual clearance bar is 5.25". The 6" standard bollard is 24" below ground. Each additional foot is $25. A core (buried) or plate (bolt to the surface) 6" steel bollard. Height is 42" above ground for a10' tall system, 66" for the 12' and 78" for the 13' system. The standard depth for a buried bollard is 24" below ground. The depth needs to extend below the frost line in your location. It is 42" for Michigan. If the concrete you set the bollard in goes below the frost line, the bollard can be shorter. A plastic sleeve for the bollard (yellow in the picture). A plastic covered vertical steel 1.25" pipe from the bollard (black in the picture). This is always 78" in height. It is welded to the bollard. A plastic covered horizontal 1.25" steel pipe with aluminum-magnesium fittings and 1.25" steel pipe corner brace (black in the picture). Max is 10 feet. A clearance bar (made of 1/4" Lo-Density Thermoplastic Polyethylene (LDPE) with Ultra-Violet and Anti-Static Additive). The bar is 5.25" x 78". The chain to hang the clearance bar is not included.You should get support chain that is at least 12". So the maximum height to the bottom of the clearance bar will be 1.25 + 5.25+ 12 (including hooks) or 18.5" below the stated height of the system. There must be at least a 12" chain to avoid damage if the bar is hit. The bollard, upper supports and the clearance bar can be ordered in Yellow, Red, White, Black, Dark Blue or Handicap Blue. Custom colors can be made for a fee. All systems are 10 ft. wide and 10, 12 or 13 feet high to the top of the support bar. The bottom of the clearance bar must be at least 18.5" lower. You can adjust it on site. Chain is not included. Fixed is standard, meaning the cross bar does not move if hit by a vehicle. An optional swing back version is available for $175 more. It allows a vehicle to go through and moves the bar back to the original position after it passes. A large spring in the vertical section brings it back into position. It is hidden by the bollard cover. The Free Standing Clearance Bar System is delivered by truck on a 4' x 11' pallet weighing around 350 lbs. for the 10 x 10 system. The vertical upright is welded to the bollard, so the vertical portion is one piece. The horizontal support bar, angle support and clearance bar are shipped separately and are assembled on site. Chain is not included. The actual height of the clearance bar is adjusted on site by you. Standard bollard is 24" below ground for the core bollard. Add $25 per added foot if you want more depth. Shipping normally ranges from $300-$400 depending upon size and mileage. Height to bottom of clearance bar, up to 11' 6"
Note that you will be responsible for unloading, so you will need a dock. If you do not have a dock, you will need a fork lift or a truck with a lift gate (extra charge).